It’s a definite game on with Arcadecon 2014. This is one that will deceive you with its size. Spread out all over the BallsBridge Hotel the con has a very relaxed atmosphere, almost homey. With TV, Science Fiction, Gaming, Talks, Cosplay, workshops, Merchandise and so much more on offer I really regret this being my first year at it. Variety is the spice of life and the organizers of this event really took that to heart with the line up they had on offer. Kicking off this line up is the great and talented Pendleton “Pen” Ward, the creator of Adventure Time and Bravest Warriors. We will have a run down of his talk up later but all I can say it was just mind blowing to meet the man, he is an epic talent. Ruth Redmond was one the guests I didn’t get a chance to see but her work speaks for itself, being someone who has worked for both Marvel and Boom Studios, one industry giant and the other a rising star.Due to timing sadly I missed my chance to meet the wonderful Robert Picardo, if the name isn’t familiar then you probably are not a Treky, would have loved the chance to ask him the nature of the medical emergency, (yes right now your probably thinking this). 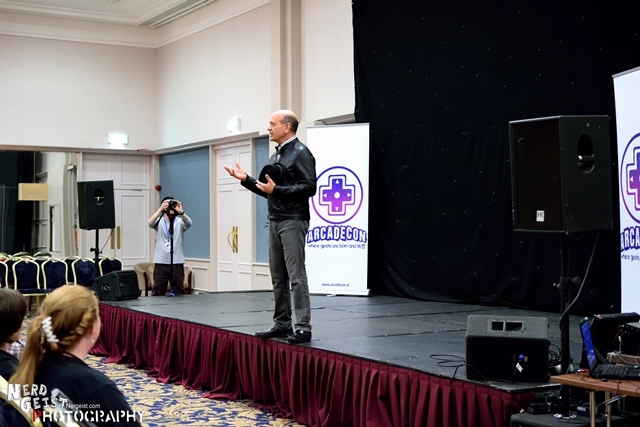 An interesting but wonderful choice as guest this year was Dr. Joseph Roche, not only has the man worked for NASA but he has been shortlisted for the Mars One project. I have to say This is a breath of fresh air, too often people forget that there is more to being a nerd than games and movies and this man has a shot at living the dream and boldly going where no man has gone before so my hats off to him and the event organizers. For all the cosplay fans out there I hope you got to see Missyeru’s Saturday talk, she was great, funny and relaxed with some funny stories and great advice for anyone out there looking to get into cosplay. Situated near the RDS the con wasn’t too far from the heart of Dublin, yet far enough that it didn’t attract any unwanted attention. The hotel had cheap parking, decent food on hand, some grumbled it was expensive but trust me it was good for what you paid, plenty of toilets and plenty of places to put your feet up and relax. The staff where well organised and easily identifiable in their purple T shirts, if we had a problem they where very quick to fix it for us or show us where to go, once again I need to thank them for guiding us around at the start. The major guests had their moderated talks which are obviously great but that’s not always for everyone, me I sometimes like a more intimate set up and Arcadecon had that in spades. The variety of the talks was brilliant, from fun topics like how to be a good GM and retro gaming to more serious topics like Racism in the Cosplay world, establishing a Youtube channel and skill building classes on developing your cosplay, which where highly educational. 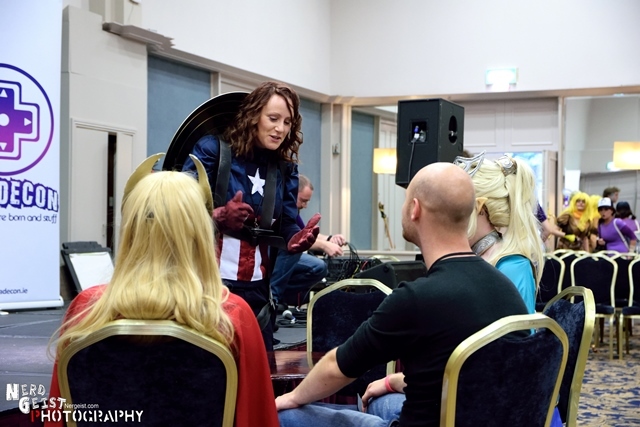 The con had so much more to offer, it really focused on getting people to meet and I find that refreshing, conventions can be big and scary, this avoided that by separating everything into rooms and holding events specifically to get people to hang out. Mix that in with screenings on Avatar: The Last Air Bender, Adventure Time and some great Anime, very polite guests, friendly people and lots of social gaming whether it be card games, League of Legends and their own Battle Royale, this con took many of the established principles and mixed its own charm in to give a great and wonderful event full of fun for everyone involved. Check out our Facebook & deviantART for more photos.